Today’s Millennial behavior is very well documented in research. They are entitled, eat and drink away from home with great frequency and look for premium experience in everyday occasions. According to the Wine Market Council research report, 36 percent of wine drinkers are Millennials. Several factors influence this consumer’s behavior. One very important influence is the story behind the brand. Telling a story in a way that is genuine and allows a consumer to connect drives an emotional connection that leads to brand loyalty and repeat usage. Even more important is the experience, consumers are looking for a better one that improves the flavor and taste of wine, and one that creates a more upscale occasion. This is a strong reason why Haley’s Corker has been so successful as one of the industry’s leading wine accessories. Designed to preserve and serve, Haley’s Corker filters out residue and sentiment, aerates to improve the bouquet and flavor, provides a drip free pour and finally corks the bottle, preserving it with a long lasting airtight seal. Best of all, the patented re-corker allows ease of opening and closing and laying a bottle flat in the wine cooler or refrigerator. Clearly wine and wine accessories that create value and provide better experiences will be important to Millennials as they age and continue to become wine aficionado’s and connoisseurs. 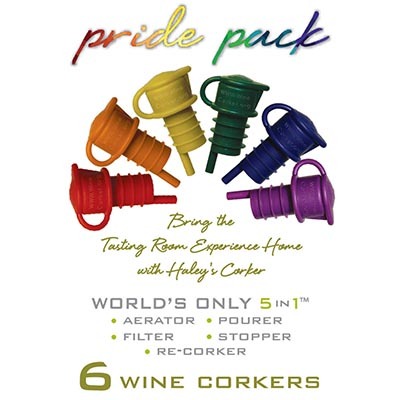 Haley’s Corker serves the wine trade industry providing a 5 in 1 wine cork which aerates, filters, pourer, stopper and re-corker. Haley’s Corker products has a patented design, constructed with medical grade plastic and are produced in the USA. Product packaging is also made in the USA using recycled plastic and soy-based ink for composting. Haley’s Corker has received an award for Top Ten Indispensable Household Gadgets from Mr. Gadget and has been featured in the New York Times, Chicago Tribune and The Gourmet Retailer.